Paris, Sénat, 2017-9-8. 69th Conference. The president of the ICHRPI, Joseba Agirreazkuenaga, chaired the Statutory Business Meeting, with 36 in attendance. The president expressed his heartfelt thanks and congratulations to Jean Garrigues, Pierre Allorant, and to Laura Mellet for their hard work and success of the conference. The minutes from the previous meeting of 2016 in Palma de Mallorca were received as published in Parliaments, Estates & Representation, 36:2 (2016), pp. 263-6. Apologies were expressed on behalf of Mario di Napoli, Lothar Höbelt, and Henry Cohn. Joseba Agirreazkuenaga, President of the ICHRPI presented his report to the assembled audience, again re-iterating his gratitude to Jean Garrigues of the French section and his colleagues in Orléans. He also took the opportunity to thank all of the office holders of the commission for their work over the year. 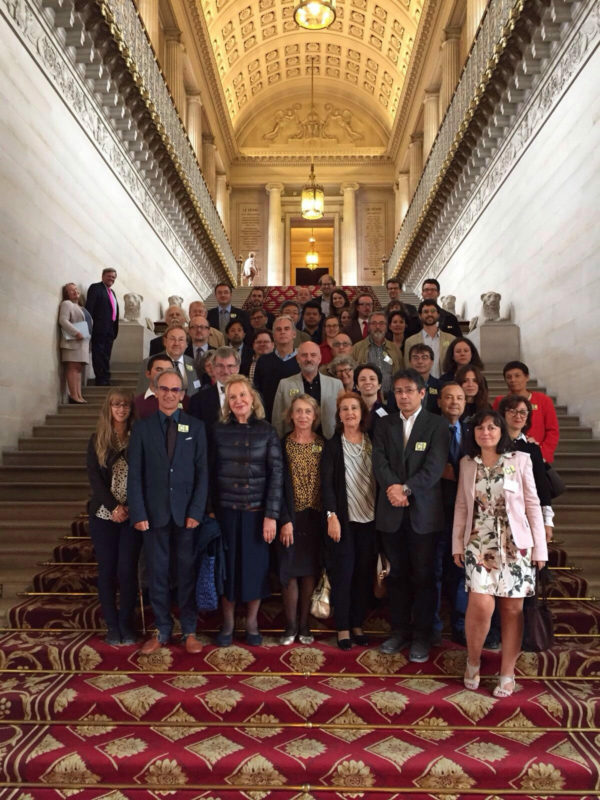 He specifically brought attention to two projects in June – one led by Maria Betlem Castellà on parliamentary commissions in Barcelona and another led by Francesco Soddu in honour of Anton Paolo Tanda in Sardinia. Both were advertised by the commission and promoted as being held in conjunction with the commission. The president encouraged those working on similar events to take the opportunity to connect with the commission. The president gave the meeting an introduction to the new website, highlighting its advantages and its connectedness with the social media platforms. Following this, the president put forward the Direction’s recommendation for a second secretary general to be appointed, with particularly responsibility for communications, media, and promotion. This was approved of and the Coleman Dennehy was nominated for the role. The president mentioned the forthcoming meetings (2018-2020) detailed below. The report was approved by the meeting. The president read the report of the secretary general. The report highlighted his work with the national convenors, and working with some of the national sections towards consolidation and consistency. The work towards numbers will be greatly helped by the work of Alastair Mann in having online access for all of our members. The report also detailed work with the president on the website, which has been greatly advanced, adding to our ability to disseminate information from the website and in conjunction with the other social media platforms. The secretary general’s report suggested with regards to the Helen Maud Cam grants for young scholars, that Eva Jedruch (chair of the selection committee) be given flexibility and confidence in continuing to do its work, particularly in the criteria for allocating grants and determining the amount. The report concluded with descriptions of the conferences for the coming three years, details of which are provided below. The secretary general’s report was approved by the meeting. The president invited the treasurer to present his report. The treasurer presented several tables with all financial information on a large screen. Overall, the financial prognosis for the commission is sound. The membership is relatively stable and this has continued our secure financial situation. He drew attention to unknown membership fees paid and some national convenors who have over-paid. Exchange rates are still somewhat volatile and need careful attention. Two issues, somewhat connected, were considered worthy of further examination. The first of these are bank charges, which can amount to in excess of CHF 1,120 in the last nine-month period up to June 2017. The other factor is that of legal personality or status, which the commission does not currently have. This is primarily because we are not based in any one particular country. The president and the treasurer agreed to further explore the issue, looking at possible arrangements that would benefit the commission and make the governance issues easier and more cost-effective. The meeting approved the report of the treasurer. At the invite of the president, the director of publications gave his report. On the whole, the work of the commission with regards to publications is healthy. The journal has seen growth in sales, particularly in online downloads, overall (excluding members) up 5%. Print is down slightly but this has been offset by strong performance in online. Full text downloads are also performing strongly, boosted by the third issue, and likely to hit 7 – 8,000 before the end of the calendar year 2017. The readership is wide, coming from around the Western World but showing new growth in India. The strongest performing articles are recent ones by Rosamaria Alibrandi (2015) and Cristina Senigaglia (2011). The highest citations come in for articles by I.A.A. Thompson (1982) and M. Hart (1991). Marketing initiatives by Taylor & Francis continue to reap rewards and generally the publisher is optimistic about our future prospects. The 80th anniversary of the commission was marked by a new jacket, typescript, and design, as well as by going to three issues a year. In addition T&F have produced a free online collection of influential essays from our previous publications, 80 years of parliamentary scholarship and the ICHRPI, along with an introductory essay by the president. Successful negotiations were concluded to allow members online access, and the last few issues relating to this should be solved soon. Social media (with thanks to Bertrand Augé and Coleman Dennehy) continues to shed light onto the commission’s activity with increasing attention towards our tweets and to our facebook posts. There have been no publications in the Studies series this year, but vols XCV–C will take in collections by Alastair Mann, et al, the Palma conference proceedings, a Bertrand Augé monograph, a Bertrand Augé festschrift for John Rogister, a Francesco Soddu festschrift for Maria Sofia Corciulo. A book by Cristina Senigaglia is also under consideration. The report was approved by the meeting. The president invited John Young to present his editor’s report for Parliaments, Estates & Representation. The editor indicated that the journal is in rude health and the jump from two to three issues a year has been successful. The first of these, Congresses versus caudillos: the untold history of democracy in Latin America, 1810-1910, was published in July and three more are in varying degrees of preparation: Parliamentary debates: a style of democratic politics (Kari Palonen & Marion Löffler), first issue of 2018; Political petitioning and public engagement in early modern Scotland, Britain and Northern Europe (Thomas Munck & Karen Bowie); Working commissions of parliamentary and representative institutions, 14th – 21st centuries (Maria Betlem Castellà, Marcella Aglietti, Alessandro Breccia, Esther Martí, John Young). The editor announced the winner of the Emile Lousse Prize: Umberto Tulli (University of Trento), ‘Which democracy for the European Economic Community? : Fernand Dehousse versus Charles de Gaulle’. It will be published PER in November 2017. The deadline for the prize is 18 May 2018. Dr Young made a point of highlighting that, in keeping with recent years, the prize has a relatively low number of entries. Other trends continuing included the relatively low number of submissions by our members, relatively high submissions from non-members (which he cited as an intellectually positive sign), and that without the initiative of the editor and other individual members, there would not be enough articles for three issues. The editor also highlighted the fact that whilst individual members of the commission are helpful in sending titles to be reviewed, he would like to see more national convenors involved in the process. The president announced that the Direction had appointed Coleman Dennehy as Reviews Editor. The report was approved by the meeting. The president invited Eva Jedruch, chair of the selection committee gave for the Helen Maud Cam grant, to present her report. Generally the chair was pleased with the workings of the grant application and selection process, and had identified areas for streamlining. Neil McIntyre (Glasgow), Giorgio La Neve (Palermo), Giuseppe Mecca (Macerata), and Daria Safronova (Moscow) were the four beneficiaries. She thanked Gerald Kohl and Sandro Guerrieri for their support in their work on the committee. The report was approved by the meeting. Maria Sofia Corciulo reported on relations with CISH. They concerned the next meeting in Moscow and the selection of themes for the CISH meeting in Poznan in 2020, which will be attended by Mario di Napoli in place of Maria Sofia Corciulo. The commission has put forward the theme of ‘Les parlements transationaux dans leur evolution historique après la deuxieme guerre mondiale: Limites et perspectives’, which will be formally accepted at the next meeting. John Rogister spoke to reiterate the role of all members in having input into the selection of themes for the commission sessions of the day and a half. The meeting approved of the report. Two reports were given by those organising future conferences. The next conference is being held in Vienna (10 – 13 September 2018), organized by Gerald Kohl. It is being supported by the Austrian section and also by the Institute for Legal and Constitutional History at the University of Vienna. The themes will be ‘Parliamentarianism and state founding’ – parliament and state foundation in general and also ‘Glory and misery of the parliamentary concept 1918-1938, ‘The quality of (parliamentary) legislation’, and ‘Parliamentary infrastructure: building, assistance offices, technology’. Excursions are being planned for Eisenstadt and, in cooperation with the Hungarian section, to Sopron. The 71st conference will be held in September 2019 in Andorra at the invitation of the parliament of the Principality of Andorra. 2019 marks the 600th anniversary of the establishment of the Consell de la Terra. Mikel Urquijo made a brief presentation and circulated information about the event and about Andorra generally. The 72nd conference will be held in Poznan, Poland as part of the CISH meeting. There is currently nothing planned for 2021. All items on the agenda having being covered, the president closed the meeting.